All children learn at different rates. Even though most toddlers go through similar developmental stages, they may not go through these stages at the same time. Toddlers are not ready to read texts on their own, but you can do activities with your toddler so that he or she is ready for reading by age four or five. Toddlers are sometimes able to identify the title of a book and may understand that phrases are read from left to right. Some toddlers know that words represent meaning and that the pictures in a picture book depict the meaning of words. This is not always the case, which is perfectly natural. Toddlers typically learn the most successfully at a pace that's comfortable and enjoyable. What you present to your toddler will often be what's repeated back to you. 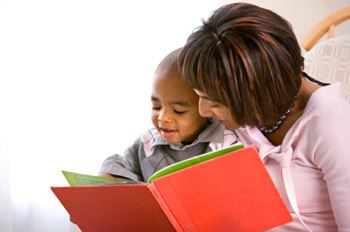 For example, if you read rhyming books to your toddler, he or she will become familiar with them. Your child might not comprehend them fully, but will respond nonetheless. Most toddlers enjoy stories and will gladly take an active part in the reading experience. Change your voice for various characters and scenes in a book to give your toddler a better idea of what's going on. Observe your child's responses and react accordingly. For example, if he or she is laughing, encourage this behavior by laughing along with your child. Toddlers tend to be very hands-on. Let your child touch and play with books. Because reading becomes a solo activity in later years, you may consider letting your toddler spend alone time with books. Write a list of reading goals for you and your toddler. Go over this list every day with the objective of checking off as many as possible. Make sure that the goals are both fun and attainable. A solid first goal is: 'Did I read to my child for a minimum of ten minutes today?' Because kids often pretend to read aloud before they actually can, another might be 'Did I listen when my child tried to read to me?' If you think your child may not understand texts when you read them, consider, 'Did I point to pictures in a book and describe them to my child?' These are just a handful of examples to choose from, but you can create your own. Toddlers are often ready to learn the alphabet when they are approaching three years old. You can teach your toddler the alphabet by singing the ABC song and reciting the alphabet together. You can also give your toddler alphabet-based coloring pages and books. Alphabet blocks are both a fun toy and effective learning tool. Stack them in the proper order and then mix them up. Then, help your toddler put them back in order. Give her or him plenty of time to play with the blocks alone.